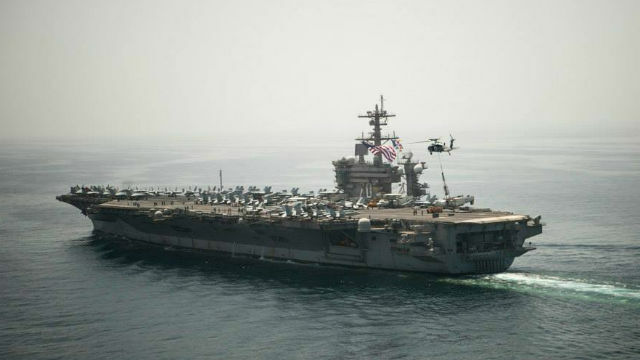 The aircraft carrier USS Carl Vinson and its accompanying ships left the 7th Fleet area of operations as the Memorial Day Weekend began and are headed home to San Diego. During the nearly 10-month deployment, warplanes from the Vinson flew missions in support of Operation Inherent Resolve, hitting targets in Iraq and Syria. The Vinson’s strike group includes the guided-missile cruiser USS Bunker Hill and the guided-missile destroyers USS Dewey, USS Gridley and USS Sterett, all based in San Diego. Some members of the Vinson crew will depart the ship in Hawaii to reunite with their loved ones. This will open space for the many crew member friends and family riding the ship from Hawaii to San Diego during a Tiger Cruise. “Although I would love the opportunity to witness and participated in all the homecoming festivities, I decided to depart in Hawaii and fly home to my family,” said Yeoman 2nd Class Tio Lathen.